Breast cancer, which will affect about 1 in 8 women in the US can be easily treated if detected early. Still, the current breast screening methods like 3d mammography and thermography are not practical to do frequently. 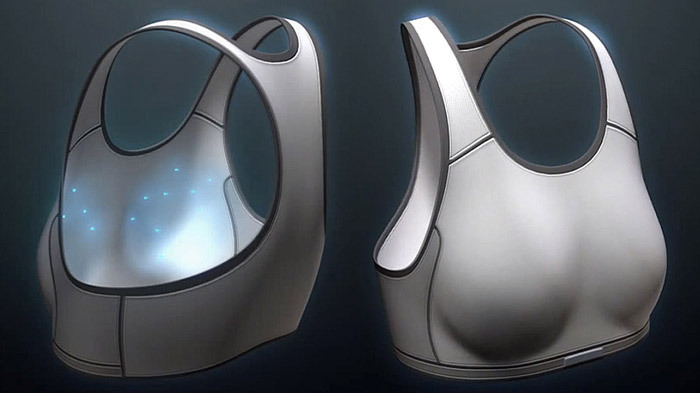 Enter the “Smart Bra,” a high-tech sports bra designed by First Warning Systems. It’s loaded with extremely precise sensors to log tiny differences of cell temperatures over time. As a tumor develops, it makes its own vasculature which results in measurable cell temperature variation. The bra then feeds this temperature data into its proprietary pattern recognition software armed with artificial intelligence. If the software recognizes a change in breast tissue it could indicate the presence of a tumor. The bra has shown impressive results in the first three clinical trials. Tested on 650 women, First Warning Systems’ device is able to detect possible tumors years before other imaging systems can — all for less than $1,000. Commercialization of the system is set to begin in Europe 2013 and a submission for FDA 510(k) for approval for entry into the U.S. market in 2014. The company is also seeking $5 million in capital funding — expected to be captured in three rounds.